Colorado Skiing; 6 Day Grand Canyon Hike | "What Goes Down, Must Come Up!" Well, let’s see, since my last post, RB and I went to the Dillon/Silverthorne area in Colorado where we skied three days at Keystone, then snow-shoed twice, once with Rock Creek Annie, who lives on her ranch in Silverthorne. Rock Creek Annie went on our Wyoming trip to the Winds last August. She’s about, what, 63ish, and kicked our asses in the Winds. She ate about 3 tablespoons of granola or something for breakfast and had a freeze dried for dinner, incredible energy. I’m going to say she was able to kick our buts hiking because she lives at 9400′ and we were coming from sea level, yeah, that’s my story. 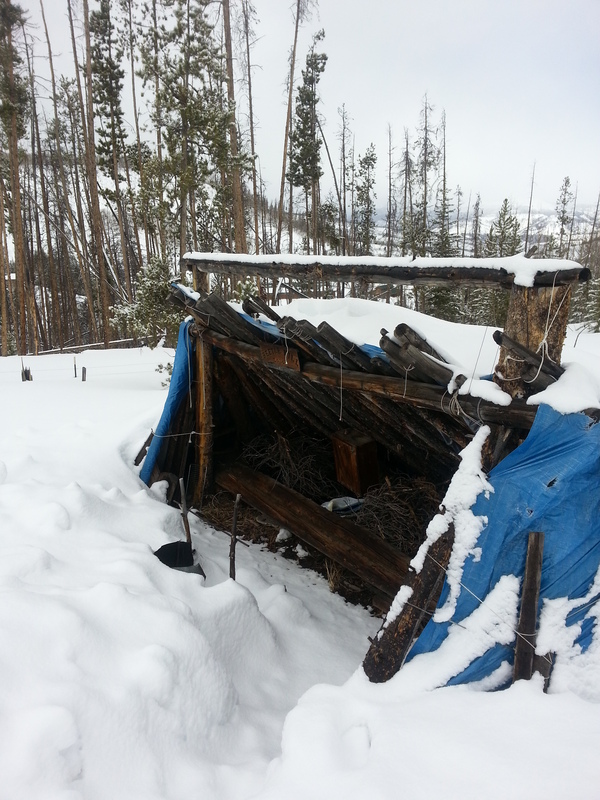 At Annie’s, we snow-shoed up to an overlook above her house where she had constructed a lean-to out of pine branches. Due to the 3 or 4 feet of snow, we had to step down into it, like a pit with a pine-bough roof. We made a campfire and roasted wieners and had hot dogs for lunch. Best hot dogs I ever had…out in the snow covered forest, on a campfire, blue sky, it was great! 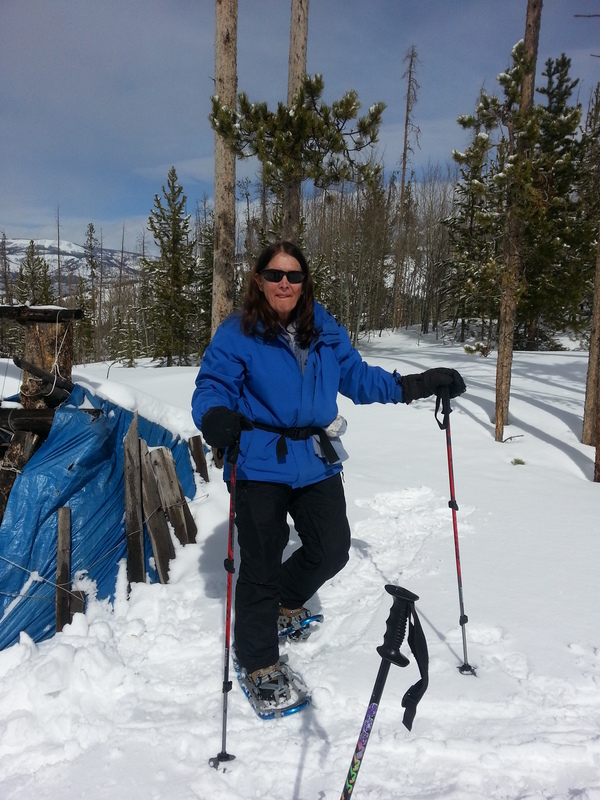 Initially I didn’t want to go snow shoeing because I had only brought my ski stuff and had already shipped my pack, boots, etc to Las Vegas to pick up for our follow-on Grand Canyon hike. RB persisted, so I had to go in my ski pants and wear my timberline boots and hope for the best. But I had a good time. The skiing was also great. Weekday skiing in Colorado is the way to go, very few people on the slopes, and no wonder, given the lift tickets at the window was over $100 per day!! Yikes! So after we skied, we went over to the FEDEX store and shipped our skis back to Virginia (RB’s snowboard). Then drove to Denver and got a hotel by the airport. Saturday we flew to Vegas, met everyone at the airport, took the shuttle to the car rental place, loaded up and took off for the Grand Canyon, stopping on the way out of town at the UPS store to pick up our packs. My box was completely torn up, but the contents managed to survive. We also stopped at the Vegas In And Out Burger, I thought it was only ‘ok’, and that it didn’t live up to its hype. For the Grand Canyon trip, it was me, Juice, Mr. Clean Jeans, and Gunny in one car and RB, Fez and scenic vue in another. Which was fine, after 6 days together RB and I need some space. We got to the park about 8 or 9 pm and checked in. Gunny had forgot about getting a room and slept on the floor of my room, pretty funny. 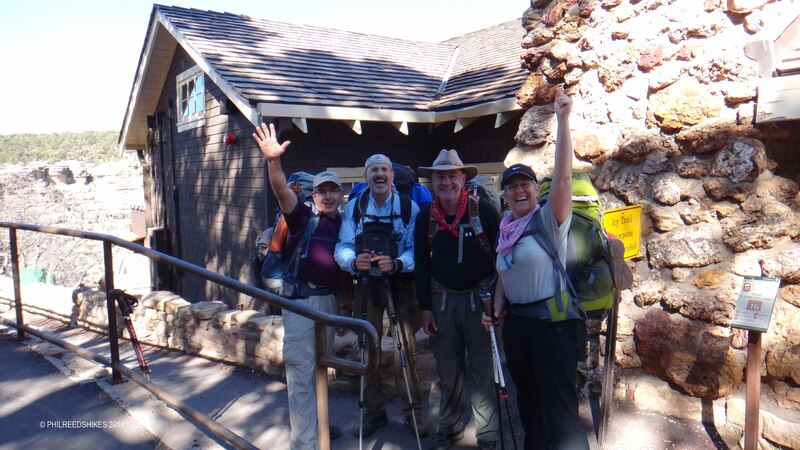 The plan was to hike 6 days, camp 5. Bright Angel Trail from the south rim to Indian Garden camp, then to Bright Angel camp, then to Cotton Wood camp, then back to BA camp, then back to Indian Garden camp, then hike out. The weather was perfect and warmer than the same time in 2012. No snow leaving the south rim so we didn’t need our mini-spikes like before. However, the trail was very wet and muddy from a prior rain, so it was still careful going for a mile or so, then the trail dried up. The hike to IG was uneventful, but still had the oooh, aaah, factor. This was only my second trip and I still felt the wonder of the canyon. 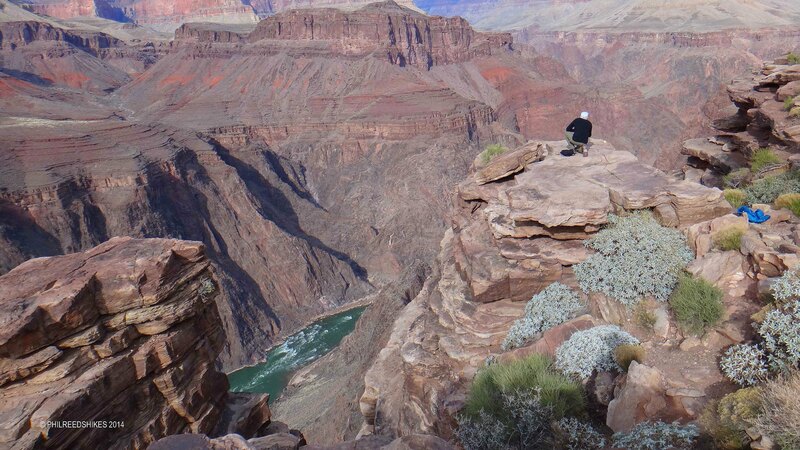 After setting up camp we took a hike over to plateau point and took our first pix of the Colorado river. 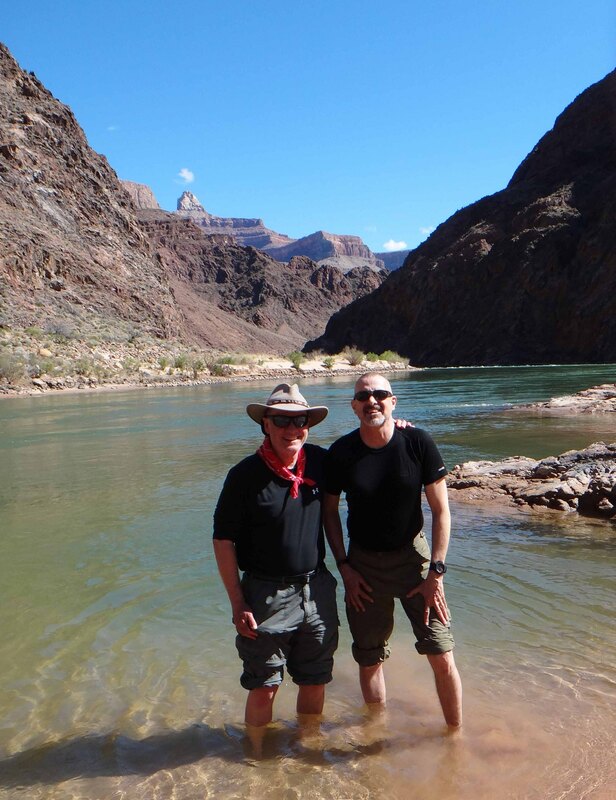 The next day we hiked down to the river and on to bright angel camp/phantom ranch. We stopped at the beach, soaked our feet, took a break and lots of photos. When we got to BA camp, I went over to phantom ranch to check on our steak dinner reservations for that evening, when the lady told me she had no record of the reservation I just about had a stroke! She did some checking and found out I had actually made the reservations for our second trip thru BA in 2 nights (which is what I had originally planned, but somehow got the dates mixed up in my head…blame it on getting old), what a relief!! The was about the most excitement I had on the entire trip. Gunny and I then proceeded to have a couple of ice cold beers there at the phantom ranch cantina/restaurant. 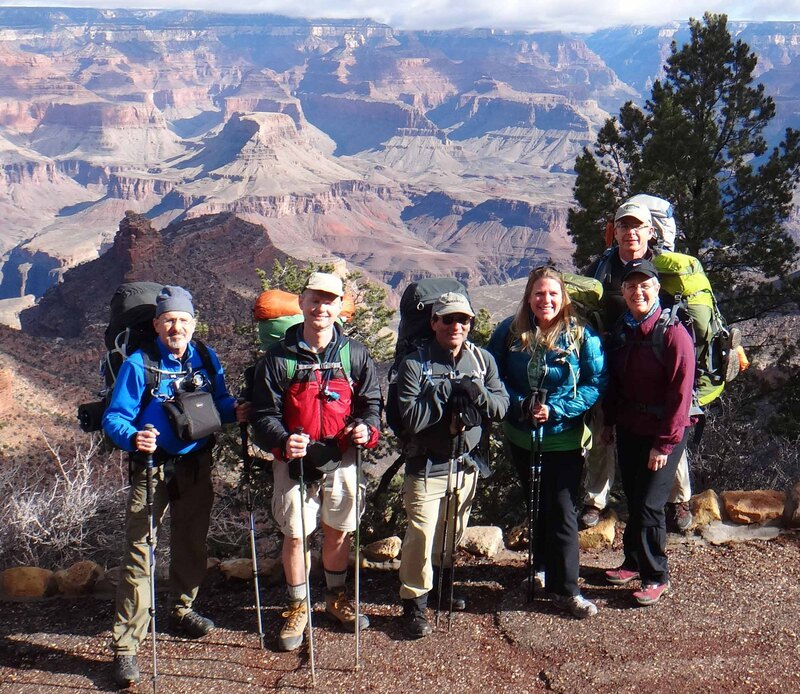 Next day we hiked on north on the Kaibab trail towards the north rim and cotton wood camp. At the Ribbon Falls side trail, we couldn’t find a good place to ford the stream from the south so we talked ourselves out of visiting the falls. So we hiked on and set up camp. Cotton wood was the only place we had to filter water. The next day, heading south back towards bright angel camp, we crossed the bridge over to the Ribbon Falls side trail from the north. The falls were spectacular! From the trail it looks pretty lame, but up close it’s massive with a huge moss build up on a gigantic rock standing up from creek. There’s also a little trail where you can walk up and behind the falls. Then it was on to BA/phantom ranch. This part of the park is more desert and more ‘open’. 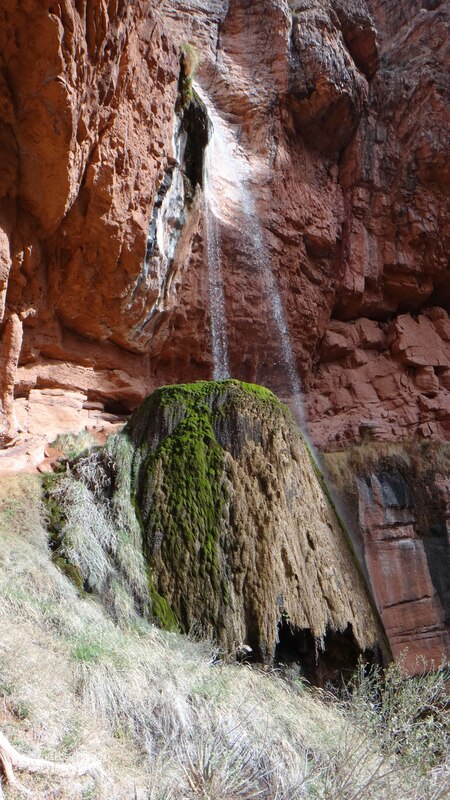 But when you leave BA camp headed north you walk a few miles in a canyon called ‘the box’ with steep walls. The trail parallels bright angel creek the entire way. The walk was much warmer than before, t-shirts and shorts (if you brought them). After setting up camp, Gunny and I did another recon of the cantina and made sure the beer was still cold, simply amazing! 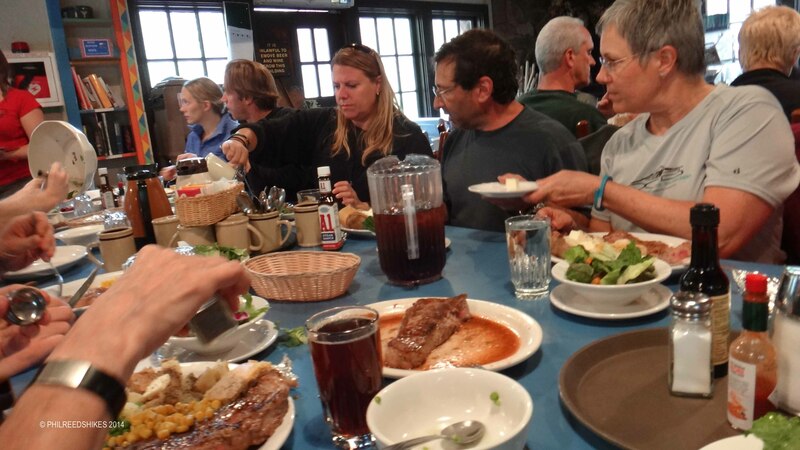 That evening we gorged ourselves at the steak dinner meal at phantom ranch; steak, salad, cornbread, fixings, chocolate cake, wine, beer, ice tea, yum! Now that’s what I call roughing it! Then it was back up the devils stair case and to Indian garden camp. No more downhill hiking, now we have to hike up for the next two days to get out of the canyon, here we go, let the fun begin! 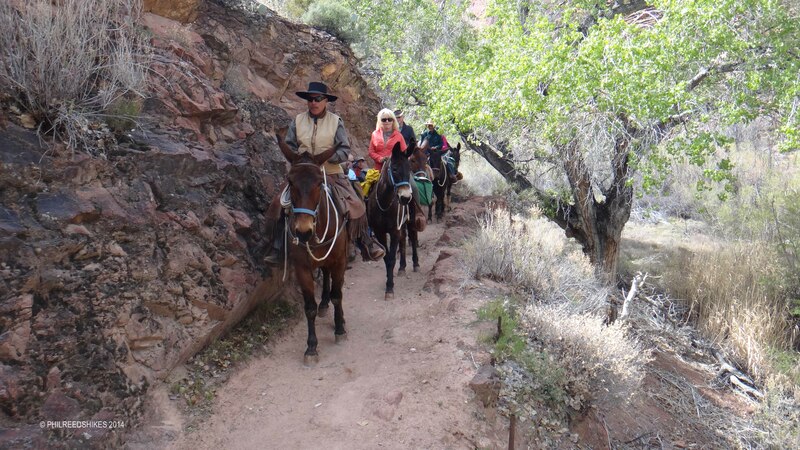 Just before we got to Indian garden, when we were on a section of trail with a steep wall on our left and a cliff of about 30′ above a stream on our right, we meet a convoy of horses and riders heading south down the trail. I’m at the back in my usual spot, the group in front press themselves against the wall, but the only spot I could lunge for was a small clear area between the trail and the cliff. When the first mule got to me, and with our group pressed between the other mules and the wall, the lead mule with the wrangler stopped and wouldn’t go. The wrangler after a few tries with the mules asks me to hide my red bandana, which I hold behind my back, still no luck but after several tries, the mules decides to go on. That was the highpoint of our excitement that day. The following morning, and last day, we get up early, in the dark, eat breakfast by headlamp. I want us to get an early start, so we can go slow and easy and before it warms up. The sun rises while we’re walking so we get great views of the canyon in changing light as we gain altitude. Gunny and I hike with Juice and Mr. Clean Jeans, slow and steady, straight on up. Victory! RB, Fez, and Scenic Vue hike on in front of us and reach the rim about an hour before us, never waiting for us so we’re denied a victory group high fives and photos. They go and eat and are already finished by the time we arrive, denying us a group victory feast, which I’ve always regarded as the best way to finish a hike….’together’ being the operative word. I just hate it when this happens, so I was more than a little pissy. 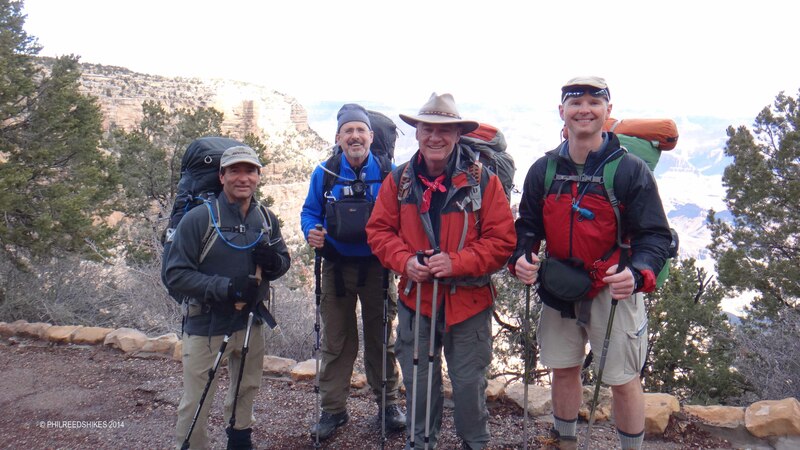 RB and his group then left for Vegas, while the four of us checked in to bright angel lodge then did some leisurely sightseeing and a little shopping on the south rim. Next morning we hit the road about 6 am, had a good drive to vegas, turned in the car, shuttled to the airport where we said our goodbyes, and that was that. A very nice trip, very smooth, no issues, and lots of beer at the bottom of the canyon. I’m considering doing this annually. The only drawback is the permits max out at 6 to a group, so you have to squeeze into the campsites. I tried to get us permits for the group sites and 8-10 people, but that seems harder to get, so we had to down size to 6. Scenic vue was able to get his own permit for 2 so we pretended to not know each other due to park rules (buts that’s another story). This entry was posted in Hikes in Virginia on April 16, 2014 by Dragin.